Here’s an important question: is the United States a democracy? Is it a constitutional republic? Or has it become something else? If you answer yes to the last question – that is, if you believe it is no longer a democracy, you don’t have to say what it has become. The transition to something else could be slow enough that we won’t be able to tell for quite a long time what new form of government has replaced the old. The great question of our time: will Americans be able to preserve their liberty? You could also say that it never was a democracy. Most would say that under George Washington it was a constitutional republic. Former President Carter and some other Democrats say that we are not a democracy anymore. They argue that since Citizens United, money – more precisely, people with money – have become the country’s sovereign power. Votes do not confer influence any longer. Others argue that for a number of reasons, the country’s government has become illegitimate. Rulers who act without constraint of law keep this argument current. Examples of lawless acts are assassination, torture, aggressive war, and fraud. Misuse of power, in secret, motivates people to say government is not only illegitimate, but tyrannical as well. A third line of argument maintains that government has just become too old, blind, sclerotic, and highly concerned with self-preservation. It cannot change, and moreover has lost its ability to respond to people’s needs or desires. Together with sclerosis, corrupt, self-serving deals among cronies make it impossible for government officials to conduct the people’s business. 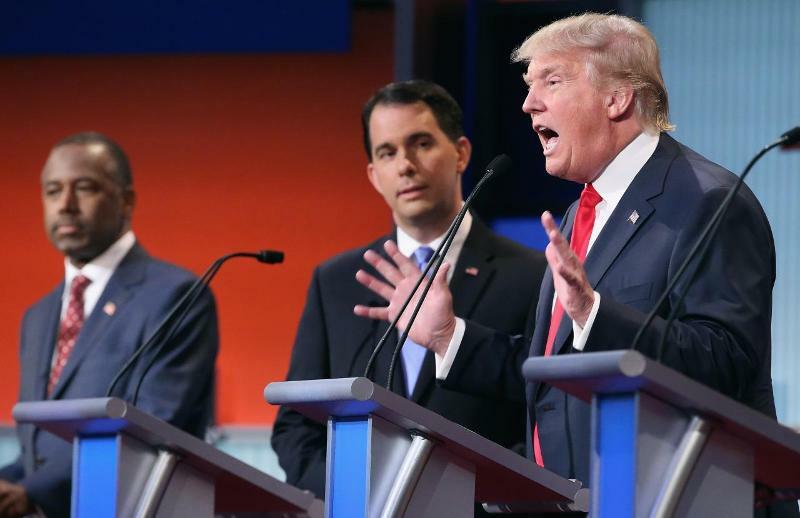 Ben Carson, Scott Walker, and The Donald at the first Republican debate in Cleveland. Interestingly, all three of these perspectives on democratic government, and how we’ve lost it, come out in discussions of Donald Trump’s candidacy for the Republican presidential nomination. Matt Bai writes about the contrast between Trump and his supporters – who clearly believe our governing system has gone way off the tracks – and traditional public servants who believe adjusting the luggage in the hold will right the ship. I’m happy to mix transportation metaphors here, as long as the point is clear! One group says that the current group of power-holders has to go. Another group, Matt Bai among them, says that would be a mistake, like throwing the professionals out with the criminals. True reform is gradual and measured, not radical and, as Bai might put it, reckless. 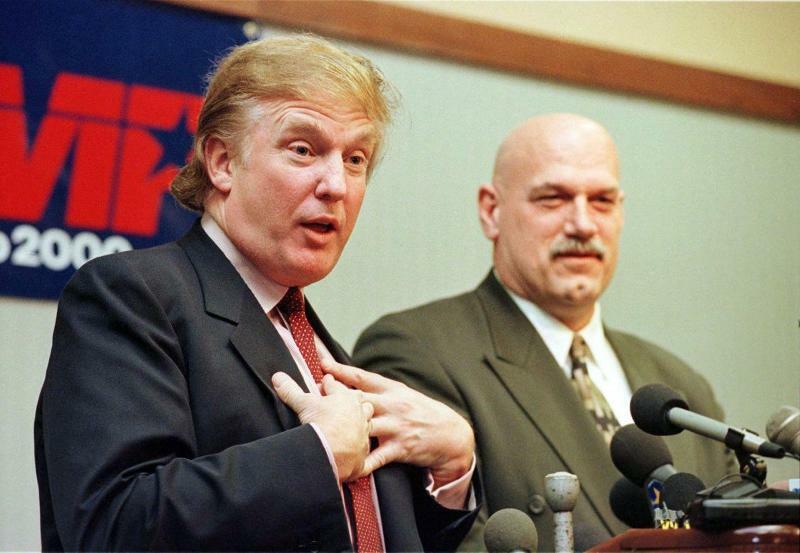 Donald Trump with Jesse Ventura, then governor of Minnesota, in 2000. Good article about the first Republican debate, along with your piece a week ago that goes back to Trump and Jesse Ventura in 1999. People who make a career of politics, however committed and conscientious these public servants might be, have overlooked crimes of people who actually exercise power in our country. Public servants put up with it, or they don’t know how to respond to it. I won’t say Trump is any more willing or capable of leading a return to democratic governance than the people he criticizes, but he does express indignation people feel that government has become self-serving, lawless, and unlimited by constitutional constraints. As you say, Trump has contempt for governing politicians – just as governing politicians have contempt for us. Donald Trump and the Tea Party – a group that has mixed up politics and the Republican Party since 2009 – will not move into the White House as Republicans. Nevertheless, people who currently hold power behind the curtain will not be there forever. Traditionalists who believe we still live in a democracy will not have any explanations ready when that transition occurs. I love what you guys are usually up too. This kind of clever work and coverage! Keep up the terrific works guys I’ve incorporated you guys to blogroll. If some one needs expert view about blogging and site-building afterward i recommend him/her to pay a quick visit this web site, Keep up the good work. It’s remarkable to go to see this web page and reading the views of all colleagues regarding this post, while I am also keen of getting familiarity. We take excellent care in conducting trademark company logo and also brand name searches. I really did not need to follow-up, he remaininged me in the loop throughout the process. Thank you for another informative site. The place else may I get that kind of information written in such an ideal means? I’ve a project that I’m simply now running on, and I have been on the look out for such information.